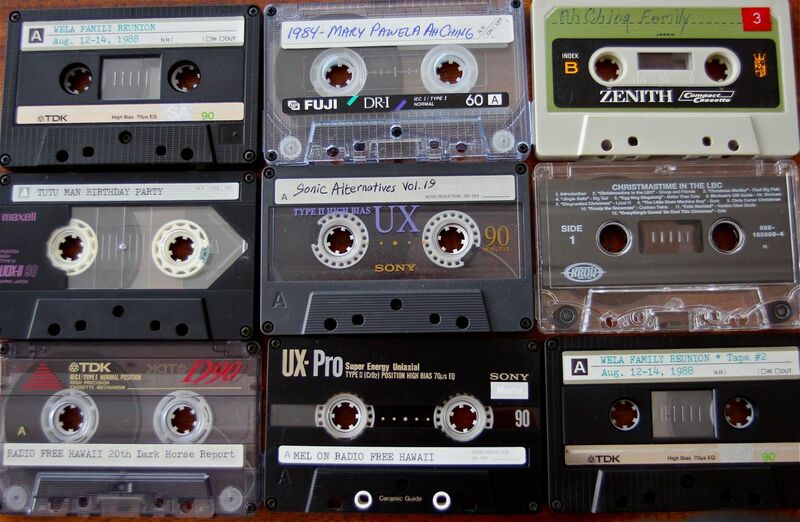 Convert your old cassette tapes to digital audio files. I recently went through my collection of old audio cassettes. I found that besides a lot of mixed music tapes, I also had a small cache of personal tapes that are audio records of life’s past events. On one of the tapes were two songs that were sung by my recently deceased Mom and her sister. That was enough for me to consider saving my tapes to a digital file format. The hard fact about cassette tapes is that in the long run they won’t last forever. Over time the magnetic particles that hold the audio will flake off the thin plastic backing that travels through the shell of the cassette. They wear out after many plays and are prone to breakage. It is also inconvenient and risky to share your cassettes with other people when you have the only copy of your mother singing or something similar. Before anything catastrophic happens to your cassettes consider converting them to digital audio files. Archiving your old cassettes to a digital format such as MP3 is not very hard. You need the following to accomplish this task. Cassette deck or player with output capabilities such as line out jacks on home stereo units or at the very least, a stereo headphone jack on a portable player. A stereo patch cord that you route from your cassette player to your Mac. While not all computers have them, the 2009 MacBook Pro that I use has an auxiliary input port, which is nice. If you don’t have one, some models will allow the headphone port to also be used as an auxiliary input. If neither is an option one can get an analog to USB dongle such as Griffin Technnology’s iMic to act as a go between with the cassette player and the Mac. Software: There are probably several software titles that will allow you to “record” your analog program and convert them in your Mac to a digital file. Just remember you are doing this in real time. If the tape lasts 45 minutes per side, it will take you 45 minutes to digitize the analog signal from the cassette to the Mac. The application program I use for recording is Rouge Amoeba’s Audio Hijack (and the earlier Audio Hijack Pro) and Twisted Wave for audio editing. A digital camera, scanner and/or image editing software while not required is helpful for the creation and editing of your digital audio file’s icon. Having a set of headphones or an external speaker is a good idea for live monitoring and later playback of your audio program. Without getting overly complicated, here are the steps to follow when converting your analog cassette tape to a digital file. RECORDING WITH AUDIO HIJACK PRO (also applies to the newer Audio Hijack 3x.). The $50 program is highly recommended if you are doing a lot of audio recording on your Mac. Load tape into cassette deck or portable player. Connect a stereo patch cord from the line out or headphone jack to the input port of your Mac (or the iMic device mentioned above). 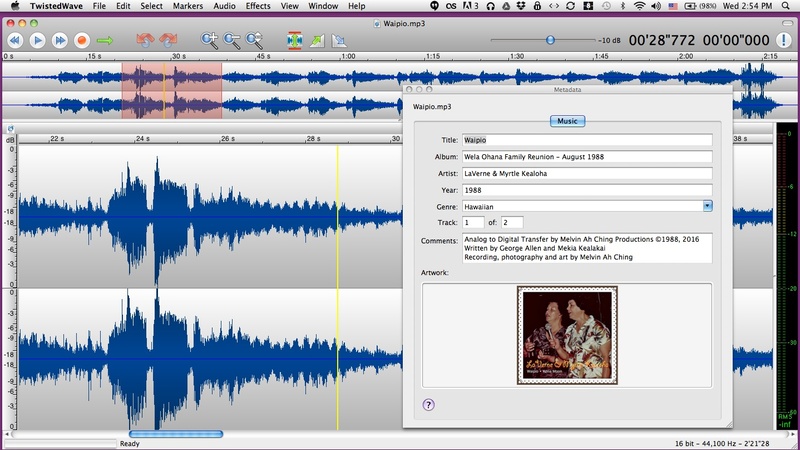 Launch your recording application on the Mac (Audio Hijack Pro for this discussion). At this point you want to press the “Hijack” button on Audio Hijack Pro. This tells the Mac that an incoming audio source is being fed to the software. Press play on your cassette deck and let the program run for a few minutes. Do this to test the sound level of the incoming signal to your Mac. Adjust the volume level on your cassette player (if possible). Set the recording level in Audio Hijack Pro for the incoming signal. Be sure that the incoming audio is not going into the red zone and getting clipped. Once you get your levels set, rewind the tape to the beginning of the program. With the “Hijack” button still activated, press the “Record” button and then press play on your cassette deck. The tape will start playing and the computer will record the incoming audio. Once the cassette program is done stop the tape. Press the “Record” and “Hijack” buttons again to stop recording on the Mac. Audio Hijack Pro will automatically save the file under a generic name to your music folder. You can check to see if the newly created digital file was satisfactorily recorded by going to the “recording bin” section of Audio Hijack Pro and playing the file back from within the app. Now it is time to either record the other side of the tape or editing the program you now have. If you want to have both sides of the tape recorded to one audio file, skip step 9 above and while the software is still recording, turn the tape over and play the other side. There will be a blank space in your recording for the time you have stopped the tape and turned it over. The blank space can be cut out during the editing process. TwistedWave for Mac OSX is a very good audio editing application. EDITING WITH TWISTED WAVE: Twisted Wave for the Macintosh is $79. There is a version for iOS @ $10 and an online, web based version that requires a subscription. The scope of this article is limited to the Mac version. Once audio recording is done you will have an audio file taken from the cassette that is now in a digital format that is ready for listening to on your computer or most portable devices. However if you want the audio file to sound and “look” professional you may need to do some editing. Here is what you can do and how to do it. First thing is to make a back-up copy of your new audio file. Save it to the cloud or another hard drive. This is because you are going to work on it in Twisted Wave. In case you do something wrong you can go back and retrieve a copy from your back-up. Launch Twisted Wave and load the audio file into the application through it’s open file command or just dragging and dropping the audio file onto the program’s icon. Twisted Wave’s pane includes 4 major sections. A tool bar at the top, an overview window of your audio’s waveform file, a larger more detailed editing window of your waveform below that, and stereo level meters to the right hand side. You will do most of your editing work in the main window which can show compressed or magnified views of your audio waveform. Note that softer sections of your waveform will have a shorter blue pattern whereas louder sections will show a taller wave both above and below the level, flat line. Areas of no sound will show no wave at all. Within this window you can cut out unwanted sounds and silent sections, create fade ins and fade outs, and even cut and paste the audio to rearrange them in a different order. You can also bring in audio from another file and paste it into the one you are working on. If you recorded one large audio file and want to break it up into smaller sections you can cut or copy selected sections of your file and create a new audio program just for that segment. A good example is if you recorded an entire cassette tape album of music and wanted to break each track into its own digital file. Twisted Wave will allow you to do that. Also from the Twisted Wave app, you can modify and edit your audio file’s “meta data“. To do that with the Mac application just hit up on the round “!”icon in the upper right corner. A pop up information window will display the file’s attributes such as track title, artist, album title, genre, track number and a place to include a photo for use as the track’s icon. All of the attributes can be edited. This is where having a camera or a scanned image file comes in handy. If you have image editing software you can edit your image file so that it creates at least a 400 X 400 pixel square image. If for example, the audio recording is of yourself speaking or singing, you can take a selfie, edit it in an image editing application and paste it into your Twisted Wave information window. After your audio file is saved, the image will become that file’s standard icon and will show up on your Mac, iPhone and other portable player just like the music files you bought from Apple or Amazon.com. The instructions for TwistedWave are online. Be sure to save your audio file after you complete the editing process. Giving the file a meaningful name like “Mom’s Song” or whatever is recommended over the generic, numerical name Audio Hijack Pro assigns to files. The above processes can be applied to the recording of any analog audio source including vinyl records, TV audio, radio, and live recording. Audio Hijack will also record sound from websites and other digital sources. Now that I have Mom’s songs preserved and converted to digital, I can share them online at a variety of venues including SoundCloud, YouTube (with digital video conversion), Facebook and more. Digitizing your old audio tapes is highly recommended if you want to keep and share those memories. This entry was posted in Applications, MacBook Pro, Music, Technology, Tips and tagged audio, Audio Hijack, audio recording, cassette, conversion, Mac OSX, music, Twisted Wave. Bookmark the permalink.